TBH, I'm not sure having a nerfed Alabama with lulz-level secondaries is worth the tag price. Sure, it knows how to give grief (especially if you have AFT + IFHE) to enemy DDs with poor decision-making skills and no respect for personal space, but the nerfed main gunnery precision (which is already reduced, compared to the NC's) counterweighs that. True, it's not AS bad as the derpiness of the Roma, but I can't justify slapping 40+ Euros just to have a ship whose main attraction are the secondaries. That said, I'm enjoying my hiatus. Will probably wait well after the RN DD arrival to start playing again. I log in, no new boat in my carousel. Recently you may have received an email from us regarding test ships being credited to your account. This email was meant to be sent to our community of Supertesters only, but was delivered to you by mistake. We sincerely apologize for causing any confusion and we will make sure this does not happen again. Damn you for making me dream, WG! That said, I already knew the first email was too good to be true, as I knew STs are recruited and not drawn at random. Ouch, I would love to be on the ST. While I have successfully completed the three first Prinz Eitel Friedrich directives, I think I won't grind the fourth and final one to get the PEF. I don't think I'll have enough time to grind 4M for the US, British, Japanese, French, German and Russian branches (24M total)...and I'm taking it slow so as to not contract another case of gaming burnout. If I had more premiums and a large stock of economical signal flags, maybe I'd bother, but I really don't feel like grinding. That said, I'm really worried about the CV rework will do to the game, especially since AA now seems pretty much worthless. Somebody please craft me a dunce cap for personal use...I think I now fully qualify for one. So I have been having a LOT of fun this past couple of days grinding the remainder of my T7 Mahan. 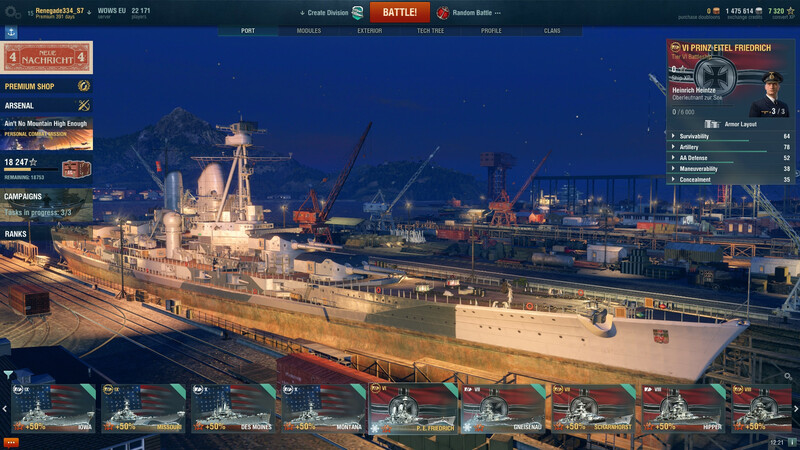 I have to say, as a cruiser and BB main, I didn't expect to enjoy a DD this much. I have often been wary of US DDs due to their short torp ranges (I'm more of a stealth player, so I prefer torps to gunnery), but the last couple of ships, T6 Farragut and T7 Mahan, have prompted me to revise my opinion on gunboat gameplay. I'm so satisfied with this ship (I'm consistently in my team's top three) I'm even thinking about keeping it in my port rather than selling it off. So not even five minutes ago, I managed to earn the 115K XP needed to graduate to the T8 Benson. I didn't intend to get the latter ASAP: I'm currently hoarding credits so that I can afford several sets of upgrades (concealment, etc) and B hulls for other ships I'm grinding (I find my Seattle grind particularly tedious and not particularly rewarding) and I'm therefore thinking, "well, I'll just allocate the XP to research and unlock the Benson and nothing beyond that". And so I put my words into practice. But my brain, due to its manifold reptilian atavisms and Neanderthalian tendencies, saw a big button called "purchase" and, before my mind could tell this vital organ to hold on, absently pressed it. And now I have a spanking new Benson in my port and I'm down from 9.1M credits to 140K. Yeah, there are some ships where you expect to do well in them, but against all expectations, they just prove reluctant to cooperate. 44K out of 242K. The road to Worcester shall be a long, tortuous one. Shame is, I'm saving my FXP for either a Nelson or a new free XP premium...so I won't spare any on this measly cruiser. FML. Well, it's funny how time eventually makes you eat your own words. I previously stated I was very unlikely to get the Roma because of its manifold flaws and...what do you know, I just turned around and got myself a pizzabote. The tortuous mental process that led to this reversal is too long to explain, but I'm not dissatisfied with my financial risk-taking here. The Roma does have a rather nasty dispersion but bloody hell...those rounds, when they do impact, they vaporize a huge chunk of HP. Perfect for punishing broadside BBs and angled CA/CLs. 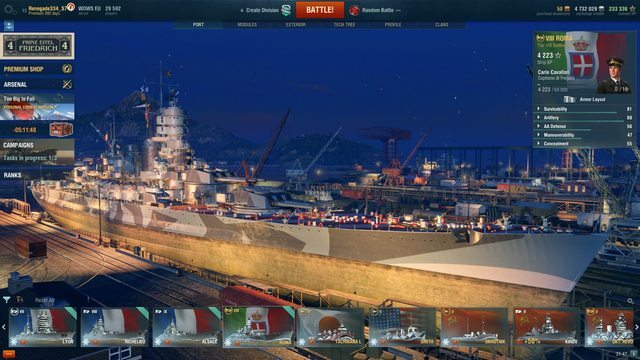 Don't know whether I'll get the Kobayashi camo: the monetary windfall is hella alluring and I'm not sure it'll be offered forever (the High School Fleet collaboration just expired, so I guess the MK collab camos are also on a ticking timer), but I'll be tightening my belt after this rather pricey acquisition. You have to admit it, though: the Italians knew how to build them pretty. ION, I already have three of the six Imperial Treasury missions completed (US, IJN, KM) and am starting my fourth (the Roma), though I'm not sure I'll be going out of my way to actually get the Prinz Eitel Friedrich. Word from across the aisle says it ain't that great and I'm wary about self-inducing another case of gaming burnout. And I'm getting tired of seeing the current profusion of PEFs, Musashis, Jean Barts and Kronshtadts/Stalingrads in Random ATM. 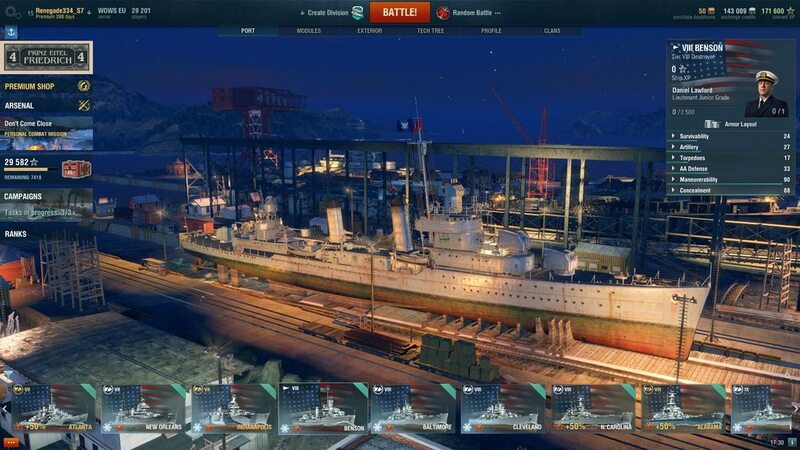 That said, I still have something like ten days to get there and I don't mind breaking out my Oktyabrskaya Revolutsiya and Warspite for a change. Three new ships in one week...that's like a birthday party, only less than two weeks early. Last edited by Renegade334; 2019-01-13 at 06:33. I'm done with the game for a long time, maybe for good. Uninstalled and deleted from my computer, I'm tired of playing and getting angry at even good games. I tried taking breaks and joining a clan but this was the final straw. It's a pity you feel that way, mate...not that I don't know where you're coming from, as I also have those days where you just want to quit and seek something better. Hope you find something else to resource yourself with. I'd advise to look into games that don't have a multiplayer component, you'll remove a potential source of frustration from your experience. Not sure if I'll ever touch a carrier again after the update... Never felt so useless, even when I got completely pwned by the other carrier. Last edited by AC-Phoenix; 2019-01-31 at 19:42. Yeaaaaahh...0.8.0 feels like a huge clusterf***. Due to family concerns (health scare) I wasn't able to jump into Randoms yesterday but today on my first match I was met with pure chaos and it's not exactly a good feeling. The air wings (now two CVs per side, on average) are just relentless and with their ubiquity the concealment you worked so hard to pay off feels almost useless...and to top it off, WG nerfed that skill. I had aircraft attacking me from every bloody direction, distracting me from ship-on-ship engagements, making them an even greater nuisance than before. Thankfully the air damage isn't as catastrophic as before (AP bombs and torps), but their persistence counterweighs that a lot...and in some cases outweighs it. DDs are feeling the brunt of the changes as they are being actively hunted now (and to top it off, they also lost some of their stealth as aforementioned) and almost permaspotted. I sold my two CVs (Ranger and Bogue) for both $ and FXP and that theoretically allows me to advance to either the Kitakaze or the Fletcher, but with DDs getting smacked and spotted left and right, I'm not sure I want to get a new one right now in these conditions. My other choices are getting a Roon (though I hated the German cruisers that had two thirds of their main battery on the back rather than the front) or a Charles Martel. Thinking about just hoarding the FXP for now. Note: WG removed all of our AA Guns Mod 2s (slot-3), uptiered them to slot-6 and put them in our inventories, which makes for a nice profit as you can resell the AAGM2s for 1.5M credits apiece and replace the voided slot-3s with the 500K AAGM1. Haven't had the chance to read the AA changes in-depth, but AAGM1, from what I heard, is the AA mod you want (more flak bursts), so that makes it a nice bonus. Don't forget to check your inventory and sell your surplus AAGM2s for a good padding. Thankfully, there is a 100% free captain respec promotion right now, meaning you can move captains around without any fee and redistribute your skill points as you see fit. I was therefore able to retrain a lot of my earlier commanders and even make them alternative captains for my main ships (for example, I have a 19-point Montana commander that is geared towards survivability/persistence and I have retrained my recently-unlocked 15-point William F. Halsey Jr. to be a more AA-centric Montana commander). However, that means I have to make certain sacrifices for those backup commanders, such as trading Concealment or Fire Prevention for Advanced Fire Training...or Basics of Survivability for Basic Fire Training, both moves I'm not very keen on: FP is a godsend on certain ships - my Montana, for one, thrives with it, and I can't wait to add this skill to both my tinderbox!Nelson and my new Roma. One thing that REALLY annoys me is that my beloved Atlanta has lost much of its AA value now, as the reworked AA mechanics apparently don't play well with this light cruiser. I sincerely hope WG will buff the Atlanta in a future patch. P.S. Hopefully the number of CVs per match will drop soon (both from boredom and maybe from a CV quota change), I feel that they're making their presence a lil' too well-known ATM. It will drop because most of us don't actually like the changes. Flak is far too OP, and by the time we now lightly damage a BB we could have sunk a Bismarck class BB without AP . It's probably closer to WoWP than WoW atm. Really not funny to play at all.